The new-new in fundraising is crowdsourcing, and what makes crowdsourcing so powerful is a concept known as the long tail. 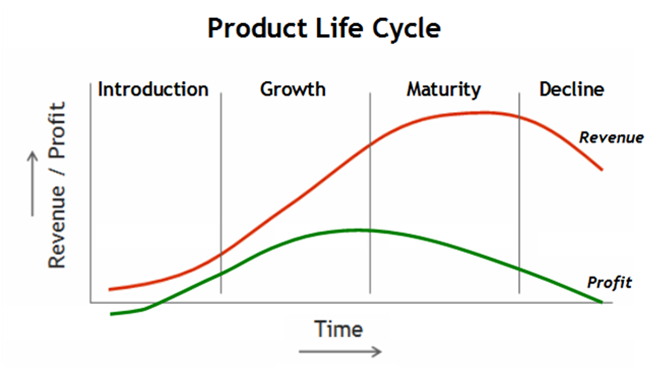 Traditionally, the concept of the “long tail” was used to describe the declining part of the product life cycle (see below). It is usually called “end of life” or declining phase. It might have been used to describe the portion of product distribution that represents a period in time when sales for less common products return a profit due to reduced marketing and distribution costs. That would make a “tail” a period of time when sales are made for goods not commonly sold as standard products. The period could be short or long. This term was hijacked by Chris Anderson in 2004 when he coined the term “long tail” to describe a phenomena where products that are in low demand or have low sales volume can collectively make up a market share that rivals or exceeds the relatively few current bestsellers and blockbusters, but only if the store or distribution channel is large enough. Today, that is what long tail is most often referred to. The long tail is about the idea that something starts with some volume, may grow, but then fades. 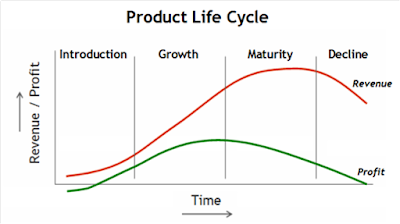 In most situations the product and specific market will disappear, on others the demand and fulfillment continue at a highly reduced level but the product doesn't change. So the long tail comes into play when the cost to distribute 1 unit of a product drops to a point that you can profitably sell one unit for only a fraction more per unit that if you sold 10,000 units. Essentially, the economies of scale no longer come into play. This now applies to film, books, records, etc. Now, you can “ship” one song on the internet and it costs me under $0.01 to do so. Before, I needed someone to “make” my album. This would involve expensive studio time, pressing vinyl, marketing the album, stocking and distributing the “physical” products. The “ENTRY FEE” to do that made it prohibitive for “start ups” (i.e. bands) to make their own albums and as such the ecosystem for any band to generate awareness and become an “overnight success” involved the recording companies and radio.. And speaking of radio, the over the airwaves radio is losing out to on demand and streaming stations (again the long tail). The long tail also allows something called “mass customization” but that is another article. As an example, incredibly AMAZON does NOT exploit the long tail for retail, but they do exploit the long tail tools of the internet to help with their marketing and distribution. That is why it took them over 10 years to make a profit. Actually ETSY started out using the long tail for its products, and as such, started making profits much quicker that AMAZON. So, think of the long tail this way: millions of markets selling hundreds of “items” instead of hundreds of markets selling millions of a few items. Take the music industry. It is moving from the short tail: a handful of artists selling millions of records, which are heavily promoted by a handful of record companies that make millions of dollars; to the long tail: tens of thousands of independent artists doing what most successful small business Internet entrepreneurs do now – niche and localize their market. Most artists may not become multi-millionaires, but by marketing locally they will be able to establish a niche following. As search engines and content delivery methods become more and more individually tailored, localized and instantly delivered, services will be offering a massive inventory of unsigned independent artists. 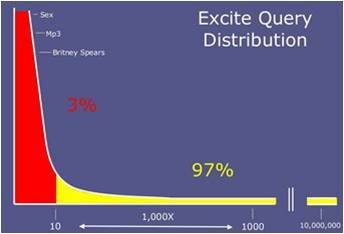 Music distribution has the potential to benefit from a long tail effect online. That’s a good thing for artists. Here is a good example of how most people do NOT know how to exploit the long tail and explains why 97% of Excite’s business was in the long tail and why they did not understand the power of it. In doing calculus, the area that is yellow is 33 times larger than the area in RED!!! You know the real reason Excite went out of business? They could not figure out how to make money from 97% of their traffic. The just could not understand that the long tail, all those queries that were as asked only once a day, was where ALL the money was hiding. Overture figured it out, Google perfected it and we all know what happened from there. Those guys figured out something revolutionary -- the long tail of search was an advertising marketplace bonanza. But it was not a traditional advertising marketplace like television, where a handful of large advertisers reached out to a handful of very large markets. It was a special kind of marketplace where small advertisers could reach small markets efficiently. You know, where the cost to reach one person is so low, that economies of scale no longer apply. It was and is a revolution to the traditional economics of advertising (where the cost of producing and distributing advertising requires large markets to justify the expenditure). Online search is a classic “new” long tail business and that is the source of its power and profit. Now, there is a new-new coming with fundraising that is using the power of the long tail to its advantage, Regulation A+ (Reg A+). Reg A+ allows a company to bypass the traditional investment bank / broker-dealer / VC / Money Manager ecosystem and efficiently and effectively deliver stock to non-accredited investors through the power of crowdsourcing. We have seen the success of crowdsourcing with crowdfunding in Kickstarter and Indiegogo. Now we will see this same principal be applied to deliver registered stock to the new investor class that heretofore has not been able to partake in the startup infrastructure of early stage investing until now. According to a 2008 BusinessWeek study there are 5 million accredited investors in the US. On average they invest $10,000 to $50,000 in a startup. In the US, about 55% of the people own stock, but there is an estimate is that 70% would invest in a startup if they could. So that is 255 million people in the US who might put $1,000 into a startup if they were given a vehicle to do so cost effectively. The resultant figure is $178 Billion larger than what Venture Capitalists and Angels COMBINED invest ($77B in 2015). Are you getting my drift yet about the power of the long tail? Now, with Reg A+, any company can sell stock all day to the average Joe and Jane and these “new” investors can now reap the rewards of a startup returning 5X, 10x, 50x or 100x on their investment in a relatively short period of time. Something that in the past, only the most well heeled investors were allowed to partake in. Of course, Reg A+ is not for everyone. It seems to be more geared towards consumer facing products and services (i.e. : think Virtual Reality devices, hoverboards, personal grooming, cosmetics, nutraceuticals, pet products, restaurants, distilled beverages, snacks, home gadgets, and video games, etc.). Still, as technology becomes more pervasive, and consumers become more aware of the power of technology to help their lives in general, you might see Reg A+ be used in startups focused on B2B concepts as well. This will all come about because of the power of Reg A+. It is in its infancy now, but in 10 years, Reg A+ may be the preferred way companies raise money, essentially bypassing the venture capital and angel networks entirely.